Before Shep was born Adam and I talked about making his baby food. It was something both of us thought would be fun but also would help save some money. Once Shep got here and we realized all of his allergies it was a no brainer for me to make his baby food at home. 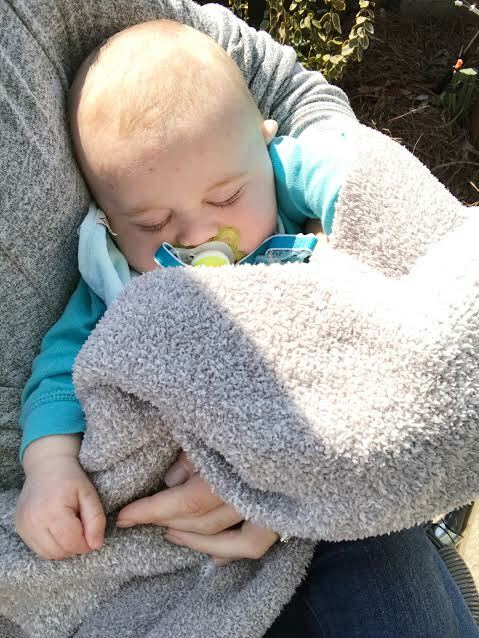 For one, I would know exactly what I was feeding him and two, it would help offset the outrageous cost of his hypoallergenic formula. 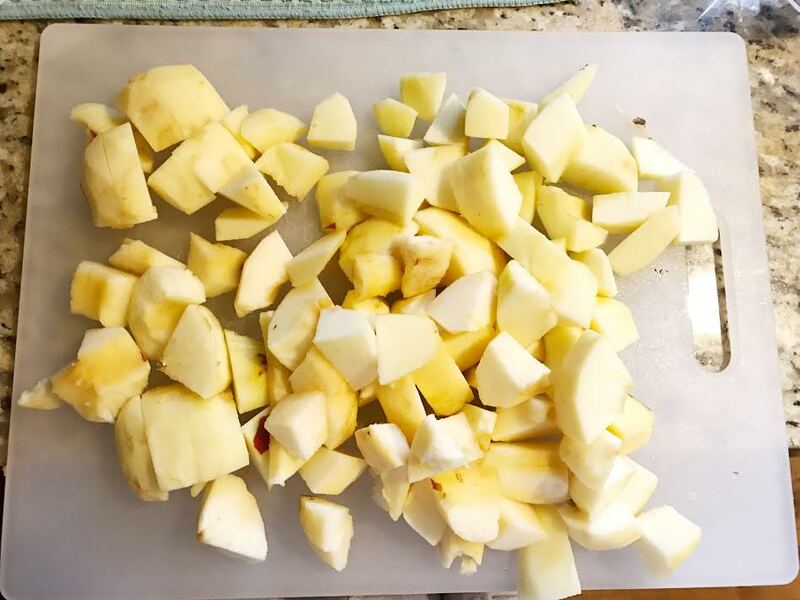 We started with squash and then moved on to pears, sweet potatoes, apples, and bananas. I've had a few people ask how we've made certain things so I thought I would just put a few of them in one post. As I make things I will add them here. So far, squash is the most time consuming to make. It's not hard just takes a bit longer than the other foods so far. This weekend I made some apples so I thought I'd share the process and explain the steps that go into making baby food at home. 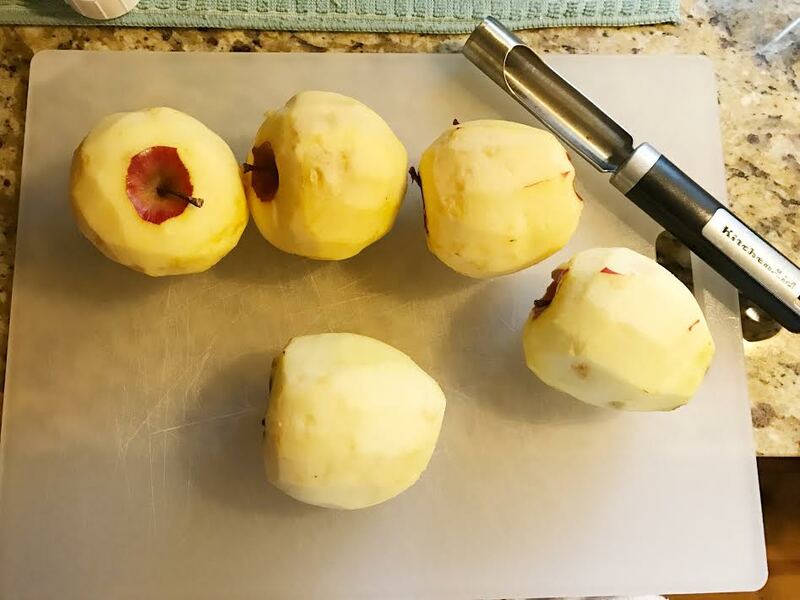 Making apples is one of the easier foods to make and takes very little time. I start by putting a pot of water on the stove to boil. Then I peel and core all the apples. I use anywhere from 5-7 apples. Then I cut them into chunks and put them in the boiling water, covered, for 6-8 minutes. While the apples are softening I will usually put in a load of laundry, unload the dishwasher, etc. just to pass the time. I try to make food during nap time so I can do other things while I'm making it and not have to worry about the kids needing something. 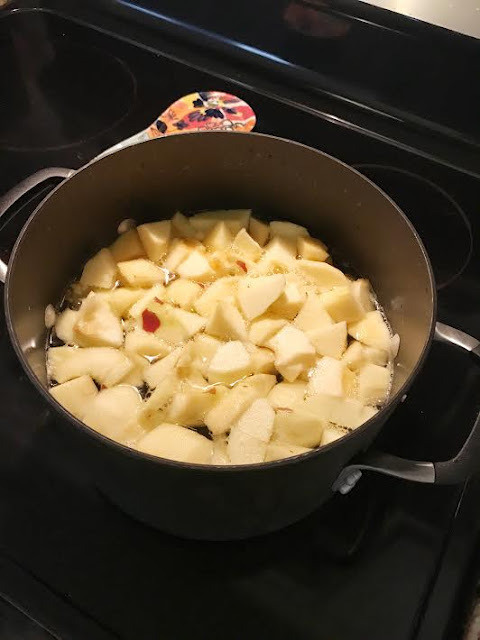 Once the apples are done I drain them. Next step is to use the blender to puree the food. We have been using the Nutri Ninja cups that came with our Ninja blender and they have worked great. Once everything is blended up I just fill up a few ice cube trays, cover with plastic wrap, and put them in the freezer. I let them sit over night and then move the cubes into freezer size Ziploc bags. Here's an example with some other food I already had in the freezer. 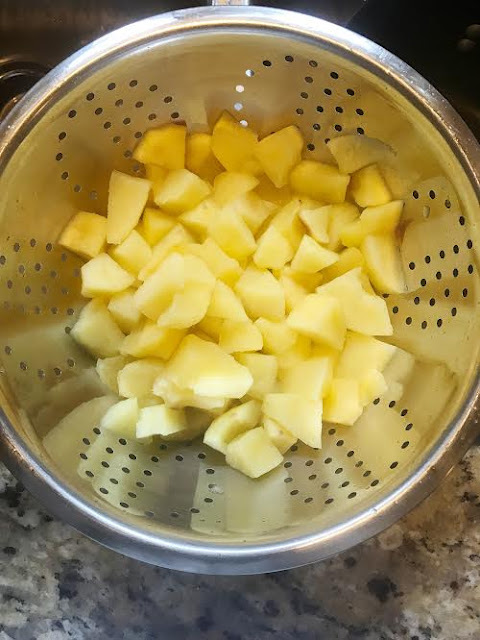 Every night when I'm getting the boy's stuff ready for the next day I will take a few cubes (usually 2-3) and put them in containers for the next day. I pop them in the microwave for about 30 seconds to thaw them and then store in the refrigerator. Honestly, it's so stinkin easy and saves SO much money!! 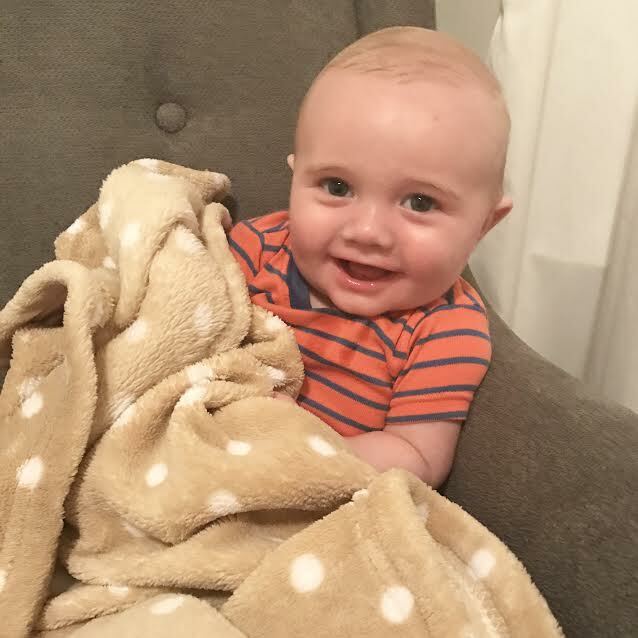 I cannot believe Shep is already half a year old! His little life seems to just be flying by. Shep is still the sweetest, most cuddliest guy ever. 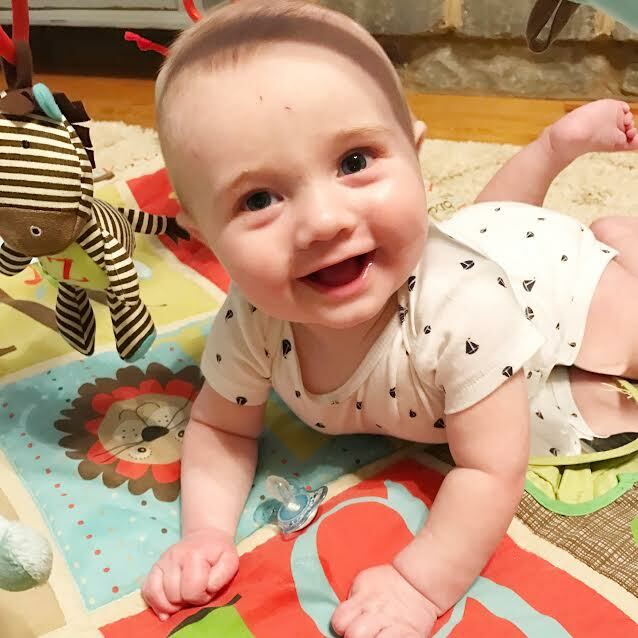 Hair: Shep is finally starting to get more hair on his little Q-ball head. 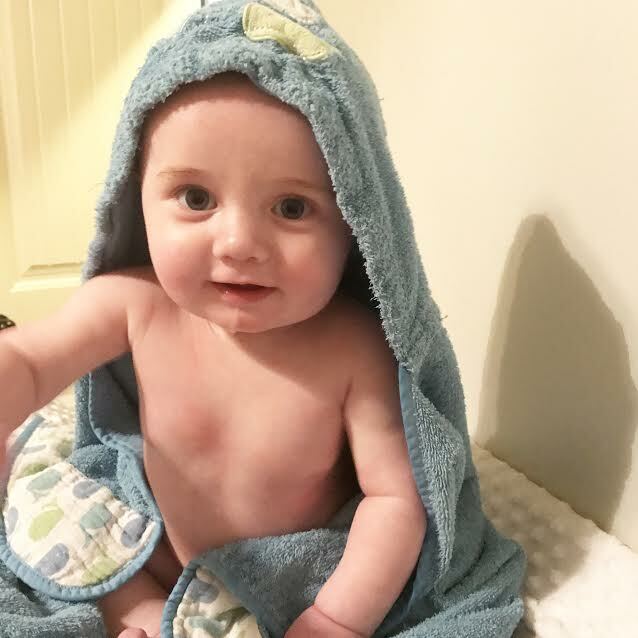 Clothes: Shep is wearing all 6 month clothes and could probably wear some 6-9 month stuff too. He is long and thick! Diapers: Shep is still in size 2 diapers but will probably move up to 3's here soon. Sleeping: This past month was a little better in the sleep department. Shep is still waking a couple times a night for his paci but overall he is getting much better. 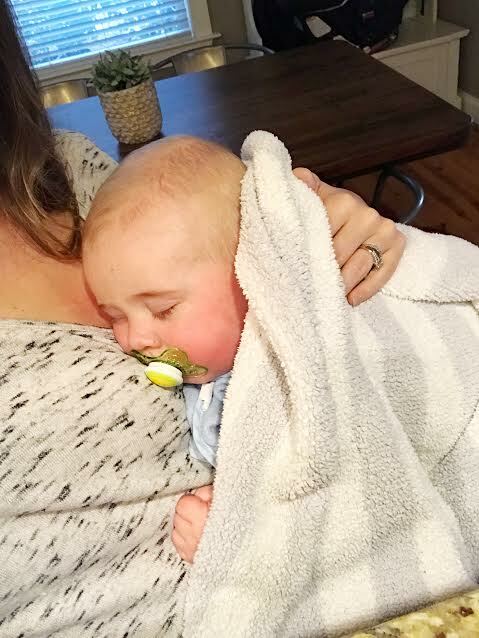 His skin has it's good days and bad days and the bad days definitely affect his sleep. Poor guy is just so itchy!! Dislikes: Honestly nothing really upsets Shep other than his itchy skin from eczema. 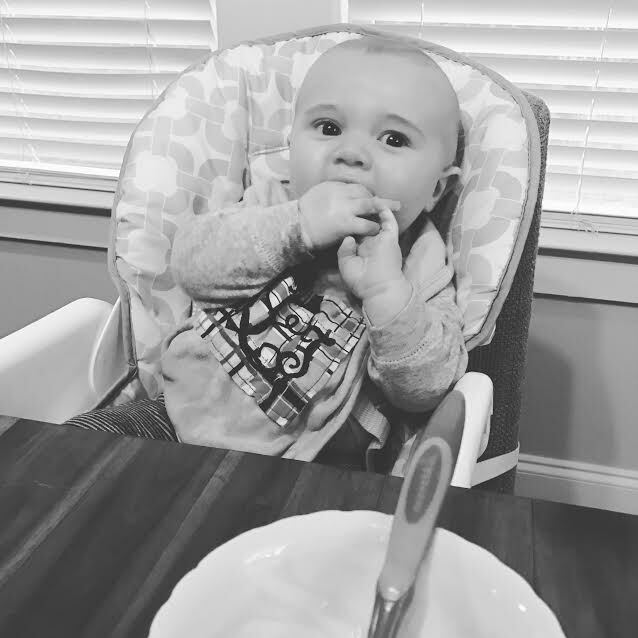 Eating: Shep eats four 8oz bottles a day and has baby food 3 times a day. I have been making all of his food and it's been fun! With his allergies I've just been so worried about giving him food so I figured this way I would know exactly what he was eating. It has also saved a ton of money since his formula is SO expensive. I will probably do a post soon on the foods we've made and how we made them. 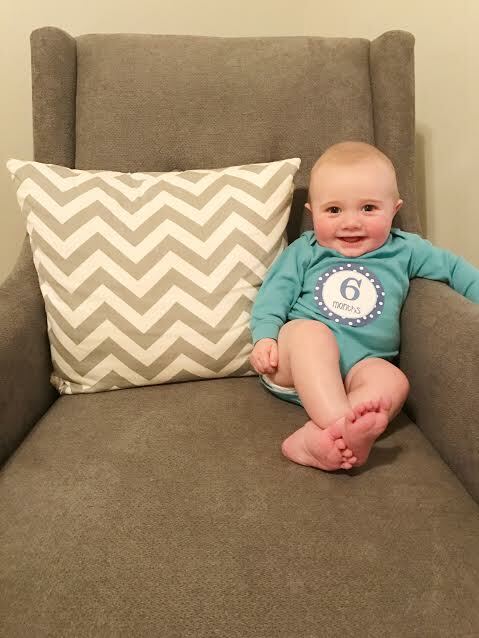 Milestones: Shep is officially sitting up! I cannot believe we are already at this stage. I really feel like he was born yesterday!! Baby Items We Can't Live Without: Shep loves jumping in his Exersaucer and playing on his play mat. We also still use our Fisher Price Sit-Me-Up Floor Seat a ton. The toy we absolutely can't live without is THIS. It is his favorite thing to play with. He will sit in his highchair and play with it while we clean/cook/etc.